Tropic is a company which was founded by Susan Ma who starred on the Apprentice and secured an investment from Alan Sugar. 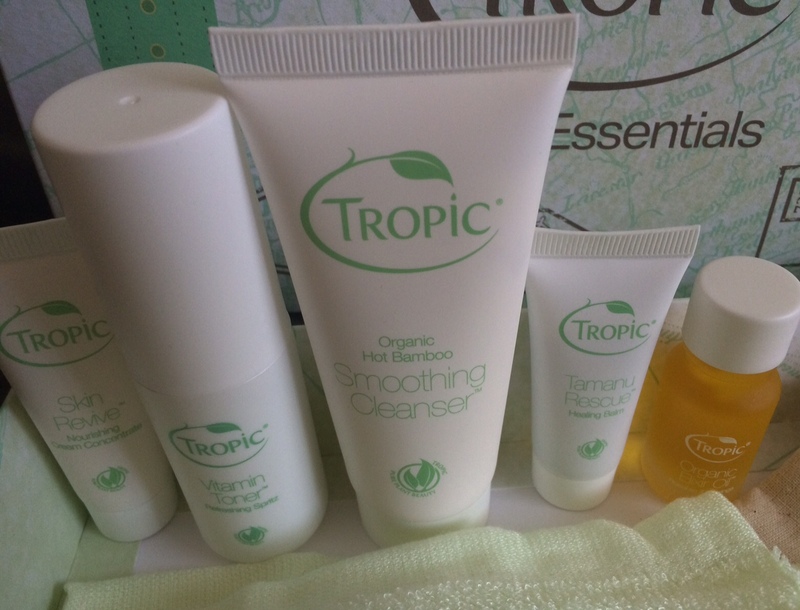 Tropic offers natural vegan products which don't contain any animal derivatives and they never test on animals. Products contain high quality plant extracts which care for the skin. Because the products are natural and use calming camomile, calendula and aloe vera in many products - they are suitable for sensitive skin. My skin is sensitive so this is great news! It's nice to see a business with a sound ethos - I love buying cruelty free and try to do so where possible. Having previously worked at Holland and Barrett for a stretch, I learned a lot about what benefits various natural extracts have so I was really excited to try these products. As you will see, I'm impressed with the products and I will definitely be trying more of the range! The packaging of all the products is very simple and reminds me of the Liz Earle Cleanse and Polish packaging as it's green and fairly plain. I think that this accurately reflects the natural ethos of the products. 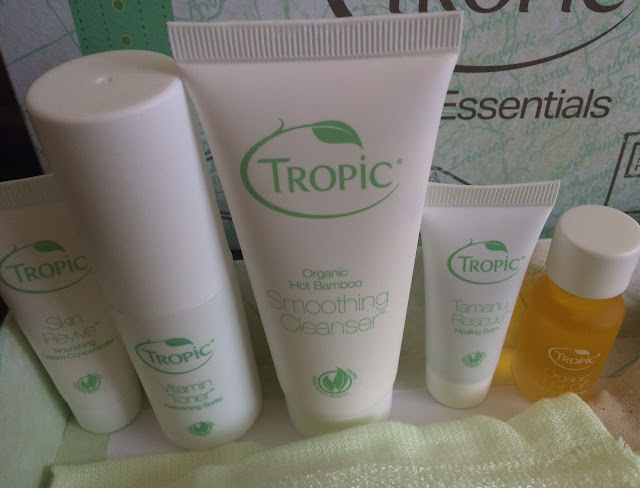 I actually got these products from Tropic Ambassador Alexandra who has been very helpful in explaining the company's ethos and by recommending products. You can order the products HERE and visit her salon website HERE. 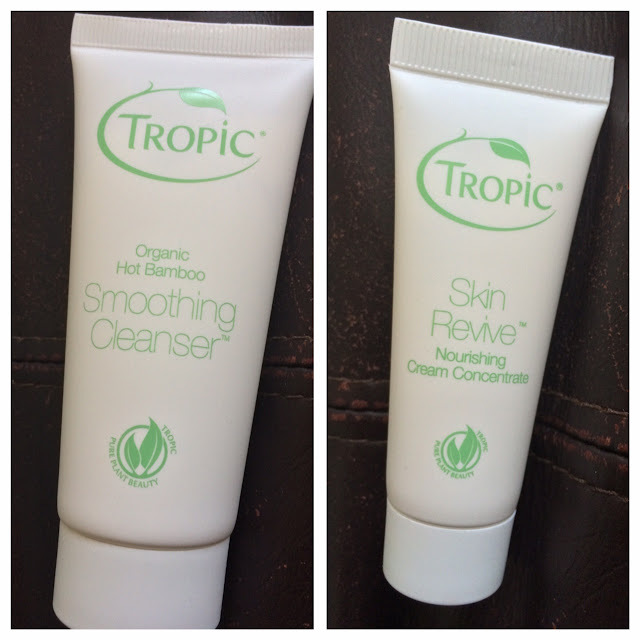 My favourite product that I tried is the Smoothing Cleanser and Organic Bamboo Cloth which retails for £15 for the two. This hot cloth cleanser contains Avocado, Golden Jojoba Oil and Green Tea Extract. I found that it melted away my makeup easily - it's very creamy like the popular Cleanse and Polish by Liz Earle. The scent is slightly citrusy with a herbal undertone, it's not offensive at all and not too strong. It's a fairly relaxing and refreshing scent which means that it can be used in the morning or in the evening. I squirt one pump on to my palm, rub my palms together and smooth it over my damp face. I massage it into my skin, leave it on for a couple of minutes and then remove it with the Bamboo Cloth which has been soaked in hot water. I find that this is the best way to use it as leaving it on for that extra time locks more moisture and nutrients into the skin. I really enjoyed using the cloth, it really is super soft but it's still abrasive enough to exfoliate the skin properly. The cloth is made from 100% Organic Bamboo fibres which is actually naturally antibacterial which is good to know. It really is super soft and apparently becomes softer with each use! I would recommend the cloth even if you aren't after a new cleanser as it truly is an absolute dream to use. The cloth is only £5 to buy too which is reasonable really! After using the hot cloth cleanser, my skin feels soft and moisturised. It's great to use before makeup - my foundation goes on so well after I've used this! It works great for my normal-sensitive skin so if your skin is similar to mine then you will enjoy this cleanser a lot. I also tried the Skin Revive Nourishing Cream Concentrate (£20). This is an intensely moisturising cream which aims to firm and protect the skin as well as hydrating it. The cream has 18 different pure extracts including Calendula, Sea Kelp, Raspberry, Echinacea, Rosehip, Avocado, Camomile etc. It really does have a lot of powerful natural extracts in it and I love using it. It's not too heavy, and it instantly sinks into the skin and leaves it feeling soft and smooth. I have noticed that the skin on my cheeks has become firmer since using this cream - and I'm not surprised with that list of ingredients! I have also been using the Organic Facial Elixir Oil (£30). This is a super silky golden coloured oil which is designed to smoothen the skin and improve your skin tone. Honestly, my skin tone hasn't changed but I love the feeling of this oil. It contains Organic Moringa, Kiwi Seed, Pomegranate Seed, Rosehip and Golden Jojoba Oil. It really does feel so silky and gorgeous on the skin. I like to use it around my neck and décolletage area as I think that it makes the skin look really refreshed and moisturised as well as feeling amazing. In the summer we all flash a bit more flesh so it might as well look fab ;) Tropic advises mixing it with their moisturiser and applying before bed for intense hydration but personally I'd only do that if I was suffering with very dry skin or sunburn. I do enjoy facial oils though, but I just use them to make my skin look good when I'm out! Another favourite product out of the few that I tried was the Vitamin Toner Refreshing Spritz (£12). It reminds me a lot of the Liz Earle Skin Tonic which I use frequently as I love how refreshed my skin feels after spritzing it all over my face. The Tropic Vitamin Toner contains Aloe Vera Juice, Organic Rose Water, Cucumber, Cranberry and Vitamin C. It aims to refresh the skin and promote optimum PH and moisture levels. I've been spritzing it directly on my skin rather than onto cotton wool first as I feel like it refreshes me a lot more this way. I simply spritz it on and then apply my moisturiser on top! The scent is very similar to the Liz Earle one - herbal/floral without being too overpowering. 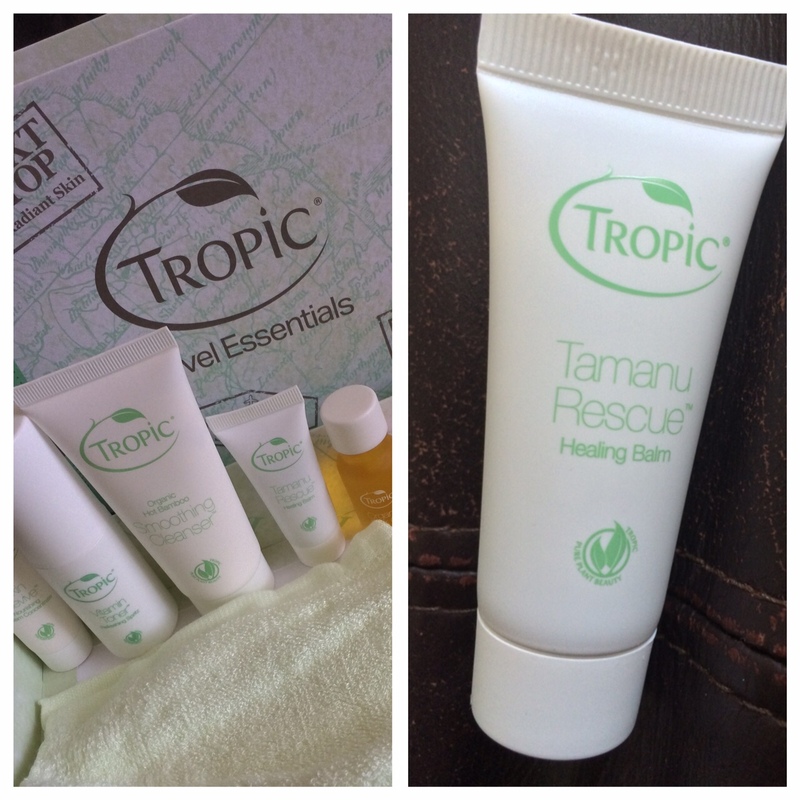 The final product that I tried was the Tamanu Healing Balm (£32). This is a multi purpose moisture balm which I have used some of before. I have used Pure Potions and a Burt's Bees Moisture Salve and I much prefer the Tropic one. The Tamanu Healing Balm has a different texture to the other products that I've tried that are for a similar purpose. It's more liquidy rather than solid but it definitely packs a punch. The balm combines the healing powers of the Tamanu plant with Monoi Butter, Shea Butter, Cocoa Butter and Blackcurrant Seed Oil. This balm has the most relaxing scent to it, I'm obsessed with how it smells. The product itself is a vibrant green colour and I've been using it on my chapped lips, spots, insect bites and a couple of scars. It's been working really well - my lips definitely respond well to this balm! I haven't noticed any dramatic difference in my scars but it definitely soothes and helps to repair my insect bites which I get a lot of in the summer (darn midges!). As it's formulated using natural extracts, it's ideal for new mums as it would work fab on stretch marks - I really think that it would make a difference with prolonged use. I think that a good quality multi-purpose moisture salve is an essential in anyone's medicine cupboard and I would definitely recommend storing this in yours! 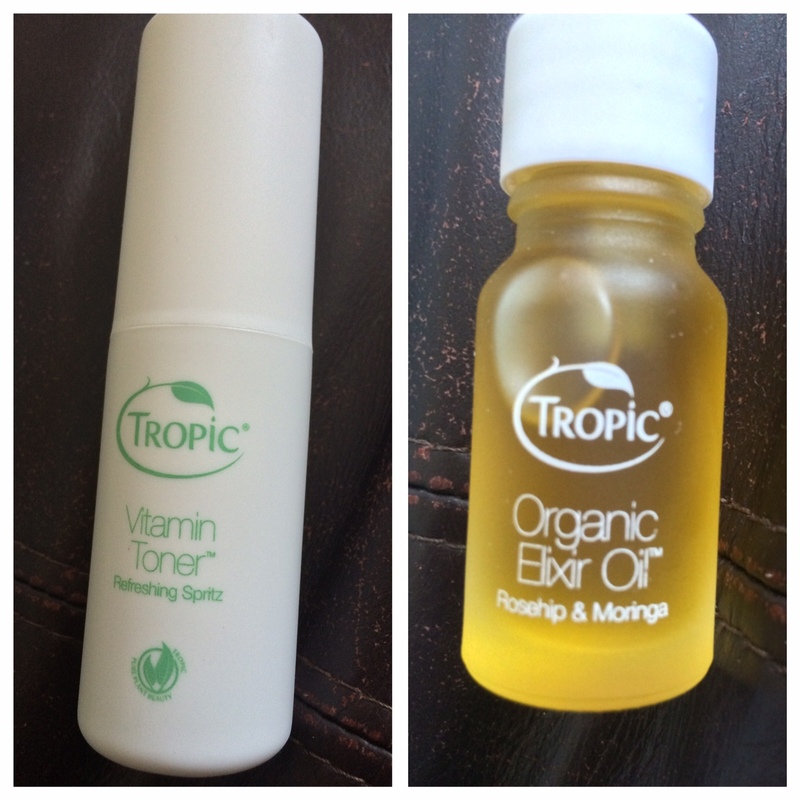 Overall, I'm pretty surprised at the quality of the Tropic skincare range. I'm a Liz Earle junkie usually but my eyes really have been opened and there's definitely some fab companies out there. I love switching my skincare routine up as I think that sticking with the same products for a long time should be avoided. I am definitely going to try some Tropic makeup next I think and I'll keep you guys updated on how I found it! Remember to check out Tropic HERE.